The year is 1939, and aboard a ship bound for North America on the eve of World War Two, a young Oxford student named Cade Martin watches in horror as a sea monster drags his parents to their watery grave right before his eyes. Alone and stranded at sea, Cade is eventually rescued by a mysterious cabal of sorcerers led by a charming old Scotsman named Adair MacRae. With the Soviets on the Eastern Front and England on the Western Front, Adair claims that he and his associates represent a lesser known third theater of war clandestinely referred to as the Midnight Front. He further explains that the Nazis have their own dark magicians working on behalf of Hitler, and that they were the ones behind the monster attack that killed Cade’s family. As the Allies’ secret weapon, the Midnight Front is dedicated to waging the magical war from behind the scenes, and now they are looking to recruit Cade to their ranks. Swearing vengeance upon those responsible for his parents’ deaths, Cade readily accepts the offer and immediately begins his training with Adair and his three adepts Stefan, Anja, and Niko. Thanks to his magical heritage, Cade masters years of skill and knowledge in just a few months, and before long, he and the other members of the Midnight Front are getting ready to depart on their individual assignments for the war effort. While the focus of the book remains on Cade as the central character, the story also allows us a good look through the eyes of the other members of the group as they travel through different parts of Europe bringing back their personal experiences and perspectives. Without a doubt, the novel’s greatest strength is the world-building. David Mack has created a very robust system of magic that involves the summoning and harnessing of demons. Called karcists, sorcerers who deal in this type of magic can hold up to eleven demon servants at a time, giving them the power to fuel their abilities. However, this can be very taxing on the karcist, and even those who are well-versed in the art can succumb to the chaos of their demons, developing self-destructive habits like unconsciously scratching their skin to shreds or tearing out their own hair. At the age of 357, Adair MacRae is one of the oldest and most experienced karcists, but his arch nemesis Kein Engel who is working for the Germans has proven to be just as dangerous and cunning. Occasionally, the story’s perspective even shifts to the villains’ side so that we can get a glimpse of what’s going on behind enemy lines. Speaking of which, Mack pulls no punches when it comes to depicting the horrors of war, the fantasy elements of his novel notwithstanding. Readers familiar with the history of WW2 may recognize a lot of the places and events mentioned in this book, as well as the tragedies and atrocities associated with them. The story takes you into the thick of things, and doesn’t hold back when it comes to the darkness and violence. And yet, even with the phenomenal world-building and historical aspect, something held me back from enjoying this book fully. If I had to hazard a guess, it would be the plot, which I thought was weakened by a few overused tropes. The “Chosen One” cliché was especially heavy-handed and impossible to ignore given the way our protagonist breezed through that obligatory training montage (because don’t you know he’s “special”?) as well as the constant reminders that “Without Cade, the war is lost!” In truth, I found Cade to be a lot less interesting than some of his fellow sorcerers, and frequently caught myself wishing the narrative had instead focused more on Anja, whose background, story line, and personality were all more compelling. For pulp-ish entertainment, I suppose this novel would do just fine, but I can’t say the story really resonated with me, and I have my doubts that I’ll remember any of the plot details six months from now. 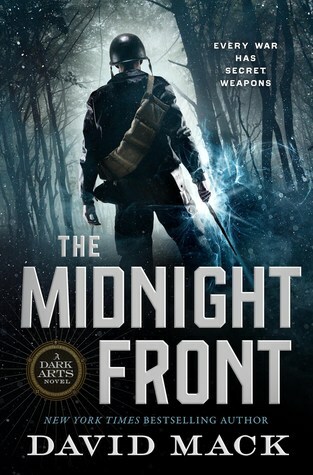 That said, don’t let anything keep you from reading The Midnight Front if the premise strikes your fancy; there’s a lot here to like for fans of alternate history, especially if the idea of a secret magical war being fought alongside the real Second World War interests you. Sure, it’s nothing too deep, but at the end of the day this was a novel I had fun reading. The actual story sounds pretty interesting. There is a lot of scope for alternate history in WWII though I’ve found them more miss than hit! Yes there absolutely is! It’s a vast subgenre, so a book would have to be really special to stand out among the rest. Yeah, same, I got a heavy military fiction vibe from the cover. There’s a lot more to it than that though. Hmmm, sounds a little disappointing, but maybe still worth it. Thanks! Yeah, I just wished it had stood out more, but it was still fun to read! I love the idea of harnessing the power of demons, but you’re right, the “parents die, son wants revenge, son saves the world” trope is a tad overused. Yeah, this one might have gone a bit overboard with the “chosen one” cliche. Maybe my mind was just unconsciously pushing back against the idea when I saw it, but the main character didn’t do anything for me at all! I’ve been jokingly saying that along as it isn’t another WW2 retelling with Nazi zombies, I’d be willing to give it a try Lol Granted the plot is a MAJOR part of the story, I still think I would give this one a go because of the world-building and it does some decently fun. Haha, I don’t know about Nazi zombies…but if you like the idea of mages and magic in WW2, Ian Tregellis has a series called the Milkweed Triptych about Nazi super soldiers versus British warlocks. It was a good series, and maybe that’s why I was ambivalent towards this book, because I kept trying to make comparisons! Mmm, not for me I don’t think – I’ve let myself get behind in February already so I’m now trying to catch up and don’t really want to add anything else. Pity this wasn’t as good as it promised though. I like the idea and the places visited as we recently went on a WWI/II tour so no doubt these places would have struck a chord. Nice review, should I add it to my TBT list? Anyone read any of his other novels? Should I start with this one, or is there one I should read first?